As announced we want to introduce our Kanban Cheat Sheet, before we start with the blog post series about Kanban. The Kanban Cheat Sheet is an individual collection of all important information and rules around this system. We want to explain the details of the Cheat Sheet to you and subsequently we begin with our Kanban series. Why did we create a Kanban Cheat Sheet? With the Avarteq being a growing company we explain all Kanban contents and requirements to every new employee and customer. We have created the Kanban Cheat Sheet, to visualize the essential content not only for internal topics but also for the cooperation with our customers. 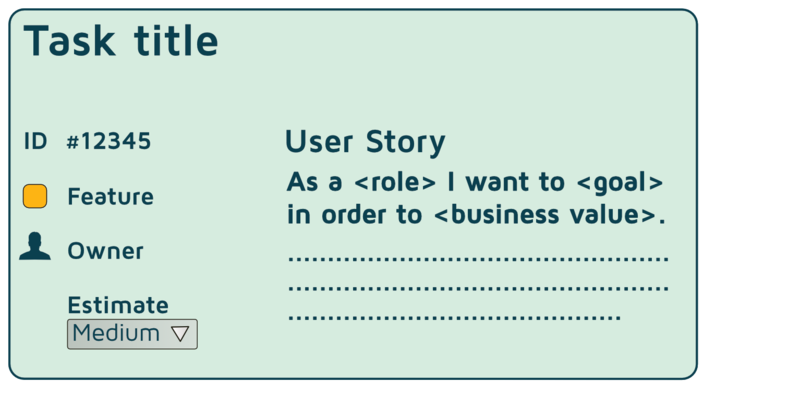 The emergence for the Kanban Cheat Sheet has taken some time, but now it works for us and the customers. With all collected experiences and positive influences on the project realization over the years, we divided Kanban into three steps. Each of these steps is significant and they build on each other. Let’s take a deeper look at the three steps. The first important step for the introduction of Kanban is to visualize the workflow. It shows the current and the imminent work, also the bottlenecks and blocker that need to be eliminated as soon as possible. Issues can be realized early and removed. With the collected experiences and opportunities for optimization, some problems become obsolete over the time. How to visualize the process? The Kanban process is primarily visualized with the Kanban board, which shows the current workflow and provides opportunities for optimization. Furthermore, the board generates transparency of the project progress as well as the implication of action and inaction are immediately visible. Bottlenecks and blockers occur in case of inaction. The Kanban board itself can be individually defined and adapted at any time and as needed. The details of the current work with the status are depicted in the tickets with the result that all participants can read all necessary information at any time. The tickets contain relevant value-added information and guarantee a frictionless and transparent workflow. In addition the classes of service are used to provide information about the priority and the lead time. Each class of service is defined by a number of rules and their order for processing is defined by the process itself. The visualization of the Kanban process encourages self-organization by defined rules for the Kanban board, tickets and the classes of service. All the rules are explicit and can be found in the Kanban policy. Furthermore the visualization generates transparency for the work progress, which strengthens the confidence and predictability towards the customer. In the Kanban process various areas can be measured. They provide information about the process quality. The WIP can be read in the Cumulative Flow Diagram (CFD). 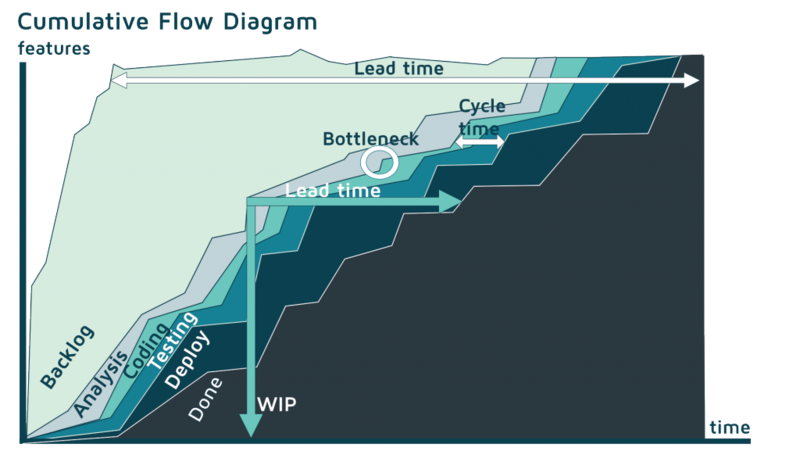 The CFD shows the amount of Work In Progress (WIP) for a specified period and condition, also the bottlenecks and lead time are shown in the diagram. With the help of the CFD all participants have retrospectively access to the development of the process because of the given transparency. 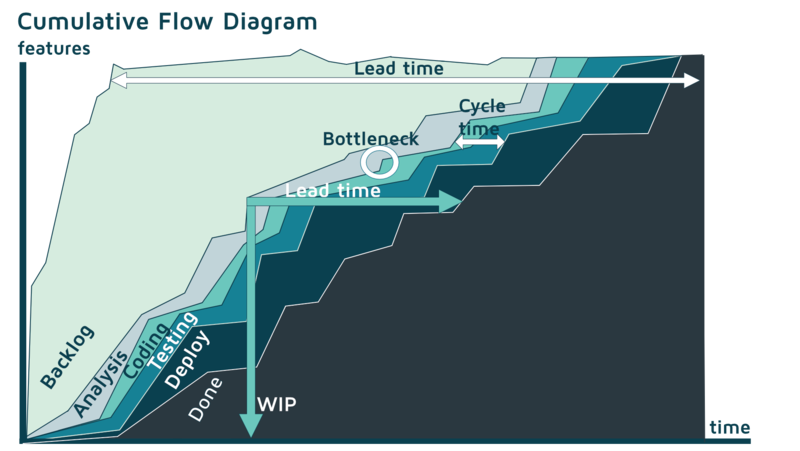 Bottlenecks are stations in the Kanban system where too many tasks are accumulated. They arise when too many tasks vary the processing times of the tasks between the stations. They are quickly identified by their visual blocker on the Kanban board. A blocker, which is not processed and rectified may lead to a stagnation of the process. Bottlenecks caused by blockers or temporal events are fixed with the theory of constraints. The Work In Progress (WIP) limit clarifies the number of started work for each column, classes of service, persons and the whole board. The WIP should be kept as low as possible. Exceeding the WIP points out problems in the system that need to be examined and treated immediately. A tool for optimization is the consideration of source of variability. Another opportunity to measure the process is the lead time. The Kanban system aims at a short lead times, because short lead times ensure continuous delivery to the customer and increase the predictability, confidence are generate. The short lead times are directly connected with the tickets, as they provide estimations. We usually aim at low estimations, such as ‘small’ (up to 8 hours). The developer can concentrate on one task with a small estimation. Hence the quality of the code increases and due to the strong focus on the work, interruptions and error rates can be reduced. The lead time begins with the ‘backlog’ and ends with the ‘done’ column, the pure coding time is called cycle time. The objective is to keep the lead time constant. In this third step of our Kanban process definition we examine the opportunities of improvements for the existing process. 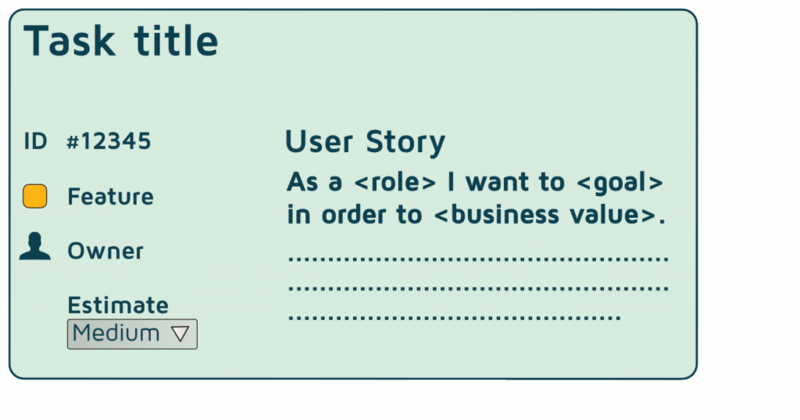 What does optimize mean in the context of Kanban? Kanban uses KAIZEN – culture of continuous improvement – which is the main component of the system. There is no clearly defined procedure for the improvement and optimization, but we use several options to optimize our system. I want to give you rough insight into the three methods. In most cases it is stated that meetings are a waste of time, but not so in the Kanban process. All meeting results support and guarantee the focus on the quality. In the daily standup the whole project team meets every morning for 10 minutes and everyone names his results from the day before and his tasks for the current day. This type of meeting includes a brief analysis of the project process, so that problems can be quickly identified and discussed in detail, also dissolved by pairing. Additionally, we have a Kanban meeting every week or as needed. It contains a detailed view of the Kanban board, the tickets and dissolving problems, prioritization of the current and also upcoming tasks. The results and particularities of the development are discussed in the whole team. Customer involvement is always aspired for the Kanban meeting. The meetings are documented and the copy is delivered to the customer, which generates even more transparency. There are other types of meetings, like follow-up, release planning and operation meeting. Next, I will explain the source of variability. The source of variability represents one of the most influencing factors for the lead time and the associated predictability. How can we distinguish and influence these sources? We can distinguish the sources with the help of the Root Cause Analysis and the Theory of Constraints. The external variations with assignable causes can be managed, reduced and finally eliminated and that means: irregular incoming and varying of size requirements, unclear and accelerated requirements. The internal (random) variations can be defined by rule control, e.g. with classes of service and their conditions. Internal variations are an irregular flow, different types and sizes of requirements. A high variability reduces the predictability for the customer. The last type of optimization which we are considering, is the theory of constraints. With the visualization, transparency and the measurement, the process can be continuously optimized and the Kanban system provides methods to recognize improvement opportunities. The Kanban Cheat sheet should help you and us to keep the focus on the key points and it illustrates the coherences between the methods. 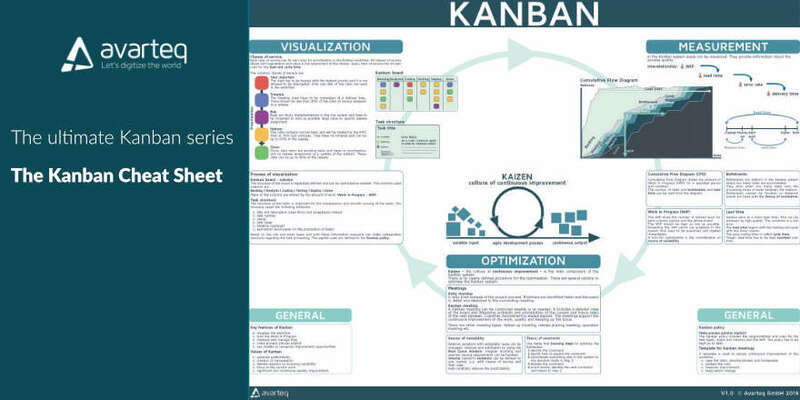 All the first insights into the three areas visualization, measurement and optimization and the rough content to that, we will consider very detailed and step by step in the next subsequent Kanban series. Within the next few weeks we will offer you a number of blog posts in which we impart to you our Kanban knowledge.